Economic stability and social justice are inextricably linked. Economic marginalization is at the heart of racial injustice. Our nation and economy are strongest when our middle class is robust—when all individuals, regardless of race or ethnicity, hometown, or family wealth have the opportunity to work hard and build a middle-class life. Housing, in particular, is a core pillar of economic stability and the middle class. Homeownership, when facilitated by safe, well-underwritten mortgages, helps families build and transfer wealth to the next generation. Affordable rental housing in safe neighborhoods near good jobs and schools helps families access the tools they need to move up the economic ladder. 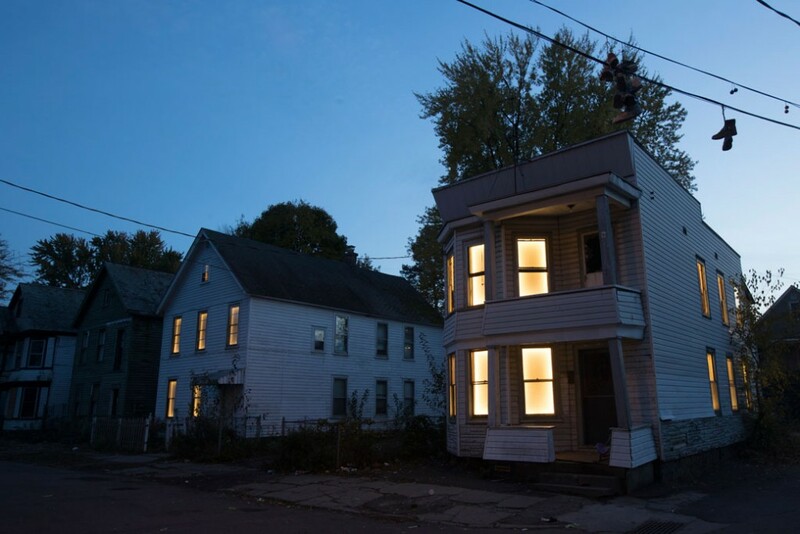 Yet, the tools for building a strong housing foundation are out of reach for broad swaths of America, including for many households of color, low and moderate-income families, and those living in small towns. This lack of access—and, at times, the intentional restriction of opportunity—undermines the strength of the American middle class. While the wealthiest have recovered, many families are still on the path to recovery, leading to historic levels of economic inequality. American neighborhoods have grown more racially and economically segregated. It is increasingly difficult for many families to rent an affordable home in a place with amenities such as good jobs, schools, and transportation. Please join the Center for American Progress for reflections from progressive leaders about how to honor the legacy of Martin Luther King, Jr. in our work to protect civil rights and to build an economy that works for working people. The U.S. Department of Housing and Urban Development, or HUD, took important steps to ensure that more families have the chance to join the middle class by getting smarter about how it allocates federal dollars on community development. Through the Affirmatively Furthering Fair Housing rule, HUD asked local governments that receive federal housing and community development dollars to make a plan for addressing residential segregation and concentrated poverty in their communities and gave them the data and tools they needed to accomplish the task. Taxpayer dollars spent on alleviating poverty will go further in communities where local leaders are committed to building more inclusive, economically competitive communities. As we look now to the future of civil rights in America as well as how to raise wages and ensure economic growth for the middle class, it is critical that we remember that a strong housing foundation is a key component of economic security. This issue brief reviews what we know about homeownership as the foundation for economic stability and thus, in no small part, social stability. It explores how the financial crisis and Great Recession have transformed the housing landscape; how the wounds of discrimination and segregation continue to fester; and how important it is to maintain and build on the progress made over the past eight years. Every family deserves a fair shot at owning a home or living where they can take advantage of economic and social opportunities. America’s economy and society are more stable, whole, and prosperous when we give working families that shot. Homeownership, when structured in safe, sustainable way, offers families the opportunity to build wealth. Home equity typically represents the largest single contributor to a family’s net worth. Families can draw on home equity to cover expenses during retirement, start a small business, or send a child to college. Perhaps most importantly, the wealth generated by home equity can be transferred to future generations, thus contributing to their future stability and financial well-being. The cost of housing is the biggest item in most families’ budgets and the hardest to adjust. When housing costs go up, a family may have to cut back on essentials such as food, clothing, and medical care. Where individuals live affects their opportunities and life outcomes.10 Where an individual lives determines one’s access to education and job opportunities, public services, health care, and safety and security. When families rent or purchase housing, they acquire not just the services of the dwelling but also the advantages and disadvantages of its location. Location of housing matters for employment opportunities.11 For example, residing in the central city and in areas with limited public transportation in a region where job opportunities are concentrated in suburban areas places workers at a disadvantage in the job market, contributing to high unemployment rates. Housing location may also exclude families from jurisdictions with higher levels of public services and better-quality schools. The foreclosure crisis has resulted in the loss of home equity for millions of families across the nation and its impact still reverberates in many communities. Today, foreclosures are down nationally and the number of mortgages that are current continues to increase.14 Despite a decline in foreclosures and negative equity rates, however, homes are still worth less money than what it is owed for them for more than 5 million American families.15 Even among communities that are improving and experiencing fewer foreclosures, many continue to experience above average rates of negative equity, suggesting that their complete recovery may still take some time to materialize. 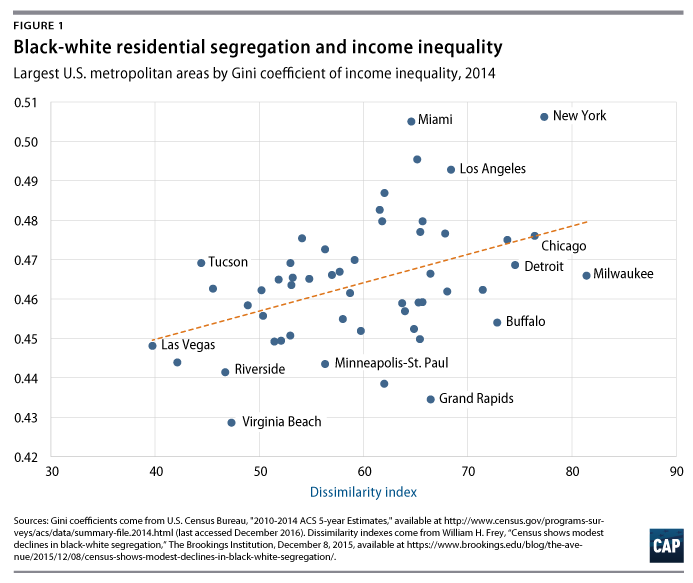 Residential segregation is a key institution for creating and maintaining wealth inequality. Combined with redlining and the ongoing lack of access to mortgage credit in communities of color, residential segregation has historically contributed to the inability of several generations of people of color to achieve homeownership and build up equity that could be transferred to and invested by subsequent generations.18 The limited opportunities for homeownership and equity building of the past several decades, in turn, account for the current enormous racial gaps in wealth accumulation. The Dodd-Frank Act, which is arguably the most comprehensive and promising financial regulatory reform passed since the Great Recession, and which implemented changes that support safe access to mortgage credit for consumers. These changes have once again made it possible for mortgages to be a tool for wealth building rather than a wealth-stripping tool. In addition to new mortgage rules, the Dodd-Frank Act established the Consumer Financial Protection Bureau, a new cop on the beat to protect consumers. The law also took important steps to strengthen the financial system to prevent another crisis. Some of these steps included greater Wall Street transparency; the separation of deposit-taking banks from swing-for-the-fences funds; capital and derivatives regulation; resolution authority that prevents the financial system from collapsing in a daisy-chain of uncontrolled failure; and more. Authorized by the Housing and Economic Recovery Act of 2008, or HERA, and fueled by funds set aside by Fannie Mae and Freddie Mac, the National Housing Trust Fund is a dedicated fund that will provide revenue to build, preserve, and rehabilitate housing for people that pay more than half their income toward rent as well as households that live in substandard or unsafe housing, which the private market is often unable to serve without financial support. HUD’s Affirmatively Furthering Fair Housing rule, which bolsters the implementation of the Fair Housing Act by supporting the development of diverse, inclusive communities with access to good jobs, schools, health care, transportation, and housing. The rule is designed to reverse the effect of discriminatory practices on underserved communities and promote equal access to opportunity under the assumption that America’s economic prosperity and global competitiveness are challenged when all of our communities do not have the opportunity to succeed together. After so much progress, we, as a nation, must not turn back the clock and return to the years of Wall Street’s financial abuse and decades of housing discrimination. Working families and distressed communities across the country are still trying to rebuild their wealth in the wake of one of the worst economic crises in American history, and several million families remain in desperate need of decent and affordable rental housing. Widely available affordable and fair housing are the pillars of a middle-class economy and a stable, just society. Government has an essential role to play. Without sustained support for the middle class and a commitment to the progress toward equality achieved so far—especially in housing—America could repeat the economic crisis and the great damage it caused to us all. Sarah Edelman is the Director of Housing Policy at the Center for American Progress. Michela Zonta is a Senior Policy Analyst for the Housing and Consumer Finance Policy team at the Center.